« The History of Carbon Nanotubes – Who Invented The Nanotube? 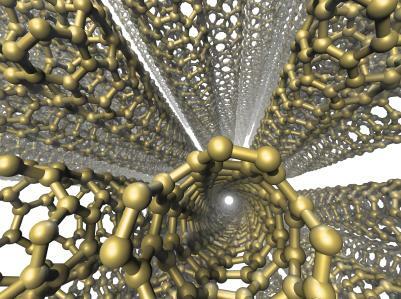 The earlier nanotubes were considered to be too thin in diameter to receive recognition by the scientific community. These early “carbon nanotubes” are now known as the “barrelenes.” At this time, carbon nanotubes were able to be observed under the higher technology of the electron miscroscope. There is realm of speculation that there are applications that would benefit from carbon nanotubes. There is agreement that the strength of the carbon atoms that make up the nanotubes have a high potential to be useful for creating stronger materials on the nano level. The nanotube is a well structured network of hexagon atoms that connect together in a rolled fashion that create a cylinder without a seam. All nanotubes measure one nanometer in width but have no real specified length requirements. It can be as short as just a few nanometers or it can be thousands of microns, even tens of thousands, in length. A nanotube is in part identifiable as the connected tubes that are then capped by ½ of the molecule known as the fullerene molecule, making it a perfect cube of atoms that are sectioned off in a very concrete, albeit microscopic manner. When these atoms come together they create a level of strength that is very high and very durable. The rolled atoms that are capped by the ½ of the fullerene molecule are considered the essential and the most basic of the nanotube structure. The capping of the carbon nanotubes by the fullerene molecule indicates that there is a preset limit to the width of the tube. There are single walled nanotubes and there are multi—walled nanotubes. When several single walled carbon nanotubes come together they are referred to as ropes. A wide variety of studies have been dedicated to, and continue to be dedicated to, discovering the potential properties and uses for the single walled carbon nanotubes. As the essential scientific prototype or blueprint for the single dimensional quantum wire, there could be endless applications for the carbon nanotube. There are three basic types of carbon nanotubes, aptly named the zigzag, the armchair, and the chiral nanotubes. Each one is named based on the way that the grapheme sheet, which is two dimensional, wraps up to create the basic tubular structure of the carbon nanotubes. In layman’s terms, the wrapping process can look like various types of “lattice” on the carbon nanotube. The incremental measurements of the lattice design are the main indicator of the type of carbon nanotube that is under the unit cell examination. The various forms of nanotubes have a distinctive measurement of their circumference as well as an identifiable pattern of “lattice” around their diameter. This lattice is technically called the chiral angle. Tunneling microscopes and electron microscopes can be used to determine the size and type of the carbon nanotubes. While the size and diameter might be something that is more tangibly measurable, other properties like the carbon nanotube’s the tube’s resistivity are much more difficult to determine. The atoms of the nanotube are so slight that the scanning tunneling microscope and the beam of the transmission electron microscope run the risk of damaging the tube. Thus, it can be highly difficult to discern various information further than the carbon nanotube’s length,width, and type requires great skill along with highly sensitive and expensive microscope equipment. Each nanotube is created by the hexagon pattern. This pattern has two distinctive carbon atoms. There are multiple carbon atoms which make up the unit cell of the nanotube. Yet, determining the size of the unit cell can also help determine if it is in reciprocal space. There are lengthy mathematical equations that help nano scientists determine the information they are looking for. The science of carbon nanotubes is a finite science. While there are practical applications for this information, many of us have great difficulty putting the practical application together with the finite science aspect. This is, however, the technology that will allow us to program the smallest of technology that can lead to prosthetic limbs that respond to thought and microcomputers that can track the smallest of nature’s environmental factors. This is also the science that holds the potential to change our world as we know it, on a financial and practical level, through the advent of materialization. Perhaps one day the practical applications of carbon nanotubes will change the very structure of our society. This entry was posted on June 18, 2009, 6:44 am and is filed under nanotubes. You can follow any responses to this entry through RSS 2.0. You can leave a response, or trackback from your own site.